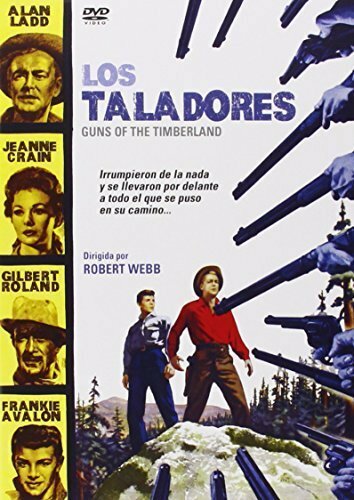 Guns of the Timberland (1960) - Region Free PAL, plays in original English audio without subtitles: Official Feel Films Spanish Region 0 (Region Free) PAL DVD release as pictured. Aspect ratio 1.85:1 anamorphic widescreen, colour. English Dolby Digital audio. Runtime 90mins. Guns of the Timberland is a 1960 feature film starring Alan Ladd and Jeanne Crain. Alan Ladd plays Jim Hadley, a logger. Hadley and his lumberjack crew are looking for new forest to cut, they locate a prime prospect outside the town of Deep Wells. The residents of Deep Wells led by Laura Riley (Jeanne Crain) are opposed to the felling of the trees, believing that the loss of the trees would cause mudslides during the heavy rains. Conflict between the towns residents and the loggers is inevitable. Alana Ladd, Alan Ladd's daughter features in the film as Frankie Avalon's love interest. The film also contains musical numbers by Avalon.